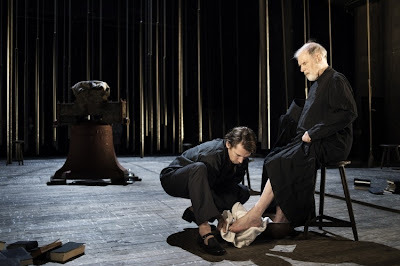 Luk Perceval and Susanne Meister’s stage version of Dostoevsky’s Братья Карамазовы (Brothers Karamazov) is a thing of stark, austere stillness, beauty and concentration. Running at three and a half hours (mit pause), it offers virtually no “action”, no special effects. No cheering diversions. None of the comforting consolations that the stage can provide. And yet, it might be one of the most transporting, “escapist” experiences I’ve had in a theatre. Annette Kurz’s stage design sets the tone perfectly. On the empty stage of the Thalia main house – roughly the same dimensions as the Lyric Hammersmith, but with a smaller, more intimate auditorium – she has created an undulating floor of black planks. In the centre there is a rusted old bell topped with rough wood. All around hang massive chime bells like suspended tree trunks (marvellously, onomatopoeically, credited in the programme as “klanginstallation” (Kurz plus Ferdinand Försch, who also composed the music that it is used to create)). Over and across this, Paulus Vogt’s lighting design casts the cold light of a grey winter’s day as if filtering in through high seminary windows; or, elsewhere, creates the impression of discrete rooms downstage, shifting subtly and imperceptibly as the narrative unfurls. Then there’s the actual “dramatic action” itself. It would appear my German language skills are in something of a state of flux. Interacting with Schwarze Augen, Maria I was pleasantly surprised by how much German I seemed to know. Here, observing Svetlana Geier’s translation of the novel, I may as well have been watching it in the original Russian. I had enough of a working knowledge of the novel to be able to keep up with where roughly we were in the enormous, rambling, discursive “plot”, but the apparent brilliance of the text and the way it was being used here washed largely over me. (I was lucky enough to see it with a couple of friends – one English with fluent German and one Austrian (with fluent English, naturally), so I could at least have my suspicion that it was brilliant textually and linguistically too confirmed, but it’s scant use to you, dear reader.) What was also useful to to have confirmed was that way that the “version” was working. Rather than picking all the dialogue out of the novel and turning it into a script as the most straight-forward English approach might, here director Perceval and his dramaturg Meister had instead cut and pasted together whole passages of the novel, meaning that we were watching something more akin to an edited Gatz-like approach. In the case of Die Brüder Karamasow, this strikes me as an excellent approach, since much of the genius of the novel comes from the way in which Dostoevsky uses the narrative voice. As such, it is great that a stage adaptation doesn’t just iron this out into the simple series of events and the things that the characters in the story do or say. Also interesting, as a result, is watching the way that the actors “perform” the “text” – hanging between character and narrative, as the original authorial voice does in the novel. There is something like the quality of sculpture in how this is executed. Even the way the space is used, how parts of the stage seem to echo, expand or contract with light or sound, seems key. The performances are uniformly excellent. It’s pretty rare to be absolutely gripped by someone just saying something you don’t even really understand. Here, that’s the sort of level of charisma we’re talking about. Jens Harzer as Ivan K. and Alexander Simon as his younger brother, Alyosha, both have something of the David Tennant about them, although watching them I was forcibly reminded both of what a beautiful language German is at a purely sonic level and how differently it can be used as a tool of communication compared with English. There is both the possibility for calmer, less jagged, more lyrical speech: less dependent on inflection or intonations rising and falling; which also makes possible a way of shouting through which works more as music than the equivalent volume in English. Patrycia Ziółkowska as Gruschenka, meanwhile, is a study in astonishing stage presence and detached physicality. She enters in off-white fur coat and hat thrown over a loose-fitting off-white dress – stark against the black void of the empty stage – and for a long while is the only significant movement on the stage, as she stalks, slow-motion, backwards, around the perimeter in high heels. That said, problematically positioned by the male gaze or otherwise, Ziółkowska clearly finds an agency of her own within the staging. Her Gruschenka is continually the most active agent on the stage. Like a bolt of lightning she illuminates the craggy rockface of the three brothers’ crumpled black lives. I wish I had already read the novel, but this production has made me desperate to do so. I also wish my command of German was such that I could deliver a penetrating and sublime analysis of how the piece’s closing moments really feel when one fully, instinctively, natively, understands the weight and connotations of the words spoken. It is a testament to the intricacy of this slow, solemn, electric production that even without precise comprehension that, as well as being one of the hardest watches I’ve ever endured, it was also somehow one of the most profoundly satisfying.